Sears Credit Cards & Shop Your Way Rewards - Are They Worth It? While recent news surrounding Sears and Kmart stores closing isn’t very positive, the company continues to remain a well-established anchor in the network of American department stores. The downtrend in brick-and-mortar shopping is clearly related to an uptick in ecommerce, and many department stores are scrambling to keep up — Sears included. As die-hard Sears and Kmart shoppers have likely recognized, marketing priority has moved more toward their Shop Your Way loyalty program and the perks that come with its associated credit cards. So how can these cards benefit you? And are they worth it, or is there a better option for your wallet? *For the first 12 months after card approval. Sears has 2 store-branded credit cards, both issued by Citibank: the Sears Credit Card® (their basic store card) and the Sears Mastercard®. Additionally, they can both be used on Sears’ Shop Your Way platform. Hot Tip: As you can see from the table above, a big perk of the Sears Mastercard® is that it can also be utilized anywhere Mastercard is accepted. This is the definition of a basic store-branded credit card. It doesn’t come with many perks, and it can only be used within the Sears Holdings family of stores (see list above) and on the Shop Your Way platform (see additional details below). Let’s delve into the (minimal) benefits. 🗓 Special financing (select products): The Sears card gives shoppers the option of special financing on certain products including but not limited to appliances, electronics, fitness equipment, automotive merchandise, and tools. *A note about special financing: KNOW YOUR TERMS. There’s a big difference between “No Interest for 6 Months” and “No Interest If Paid In Full Within 6 Months”. The latter is what we call deferred interest; we’ll chat more about that in the Fees & Drawbacks section below. 💰 Exclusive savings: Sears states that cardmembers are given access to special deals, savings coupons, invites to cardholder-only events, and the ability to earn points when you use your Sears Credit Card® through the Shop Your Way program/portal. 🔐 Account protection: This comes standard with just about every single credit card nowadays…so while they’re touting it as a perk, it’s really just a given. In addition to the basic card perks above, Sears Shop Your Way Mastercard® holders also have the benefit of flexibility when it comes to viable purchase locations since this card can be used anywhere Mastercard is accepted. Additionally, cardholders are automatically enrolled in the Shop Your Way rewards program (more details below) and are eligible for category bonus benefits as shown in the table above. Before you get too excited, we should point out that these benefits are only applicable for the first 12 months after the card has been approved, which is a huge bummer for many users. After the first year, your bonus perks are gone and the card is virtually no better than the basic card except it can be used in more places. If you want to keep earning rewards beyond the first 12 months, there are better cards out there for you — we’ll discuss some of them below in the Alternative Rewards Cards section. Regardless, for the sake of being thorough, we’ll outline the bonus category structure here. As you can see in the image above, the terms and conditions place a limit on the amount of spending that can earn bonus points between the gas, grocery, and restaurant purchases. The 5%/3% points back applies only to your first $10,000 spent. Any amount after that will only earn 1% back. And of course, you should always read your terms and conditions as there are certain exceptions to every rule. For example, only true stand-alone gas stations are eligible to earn 5% points back. You’ll only earn the base points (1% back) at those associated with grocery stores, wholesale clubs, and superstores. Other exclusions like this apply to the bonus categories, so read the T&C’s carefully! 🎈$20 statement credit: At the time of this writing, the Sears Shop Your Way Mastercard® is offering a sort of sign-up bonus (so to speak). This promotion gives cardholders the opportunity to earn a $20 statement credit if they make $30+ in eligible purchases on their card within 30 days of the account being opened. It’s important to note that this promotion is available for online applications only. All credit cards come with their own slew of fees and drawbacks, so how do the Sears cards stack up? The first things we notice about the fees are the high purchase APRs. At a purchase APR of 27.49% variable, shoppers could get into trouble swiftly if they tend to carry a balance on their account. This is especially true if they’ve opted for a special financing offer with deferred interest. The latter indicates you’ll be subject to deferred interest. In Sears’ case, what we’re seeing is that pretty much all of their special financing offers utilize deferred interest. So why is deferred interest so bad? It doesn’t have to be if you pay off your purchase in full within the promotional period. In that case, no interest will be applied. However (and it’s a big however), if you don’t pay off your balance in full within the promotional period, interest charges will be imposed on the starting balance at the APR for regular purchases retroactively from the date of purchase. In this case, 27.49%. If you don’t know already, here’s a heads up that you should never utilize the cash advance option on a credit card if you can help it. Not only will you be charged the associated fee (either the flat rate or %, whichever is greater) but you also won’t get a grace period on the cash advance. So interest begins accruing on the balance as soon as the transaction is completed — even if you pay your balance in full when your billing statement comes. You’d basically have to pay off the cash advance within 24 hours to avoid a ridiculous APR. And let’s not even get started on balance transfers! The main drawback of these cards (outside of the high fees/penalties) is the complicated rewards program. We go pretty in-depth in the Shop Your Way Rewards Program section below, so here we’ll just say that while it gives you a lot of options for earning points, you don’t have a ton of options to redeem them. Besides, most people can earn tons of points even without having a Sears credit card. Actually, with respect to the rewards program, having the basic Sears Credit Card® won’t really give you any added benefits at all. And the Sears Shop Your Way Mastercard®? As we already mentioned and will reiterate throughout this review, you only get the bonus structure for 12 months. After that, it’s zip, nada, no bonuses. As you can probably already tell from the post thus far, we’re not big fans of the Sears cards. Unless you’re a VERY loyal Sears or Kmart shopper, there are likely far better options out there. For example, below are cash-back credit cards that would earn you more than the Sears credit cards. Plus, many are credit cards with a 0% intro APR for over a year, whereas the Sears cards have sky-high APR rates. Alternatively, if you’re a traveler or are looking to travel more, then consider the Chase Sapphire Preferred® Card, which is one of the most popular travel rewards cards out there. The sign-up bonus is worth $625 when used for travel expenses (flights, hotels, etc.) through Chase’s own travel portal, which is very easy to use. You’ll earn 1pt/$1 spent on all everyday purchases and 2pts/$1 spent on ALL dining and travel purchases. It appears there are 2 separate applications for the Sears credit cards. So unlike some other store rewards cards, prospective applicants do get to decide which they apply for. This information was a bit murky online, so I called Citibank’s Application Services department, who confirmed this was the case. If an applicant is denied for one of the cards, they will need to submit another application for the alternate card. Each card can be applied for either online or in-store. You can find the Sears Credit Card® online application here, and the Sears Shop Your Way Mastercard® application here. Neither Sears nor Citi discloses the exact credit score requirements for approval on these cards, but most sources agree that the basic Sears card is easier to get, with most applicants in the “fair” range being approved. This means you’ll need a better score (likely in the “good” to “excellent” range) to be approved for the Mastercard version. Though this is not always the case, with some outliers reporting approval with poorer scores. It should be noted that there have been some reports of basic Sears cardholders being “upgraded” to the Sears Shop Your Way Mastercard®, although qualification requirements to achieve the upgrade are undisclosed. Please note that this section discusses account management for the Sears credit cards. For management of the Shop Your Way program points, please refer to that section below. Cardholders can utilize the co-branded Sears-Citibank online platform to manage their account. If you’ve just been approved for your card, you’ll first need to register your card and create an account. After this initial registration, users can simply log in with their user ID and password. Sidenote: Sears does have a mobile app, but you can’t manage your card with it. 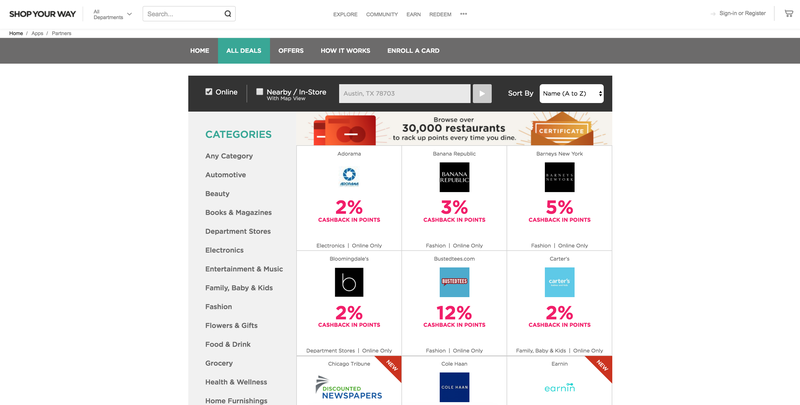 This shopper loyalty/ecommerce platform is pretty convoluted, but we’ve attempted to hash out the most important basics for you here. When it comes to the Sears credit cards, applicants who are approved will be automatically enrolled in the Shop Your Way program when they open their new account. In contrast to many other online platforms built to simply manage a rewards account, the Sears Shop Your Way platform also provides customers with an opportunity to earn points by shopping through the platform (much like a shopping portal), as well as link other credit cards to earn through additional partners. Users can also make a profile, create catalogs, and utilize a type of “newsfeed,” but we won’t expand on those here since they’re not vital to how the credit card earning/spending works. Hot Tip: We emphasize here that cardholders are earning points, because the program markets this as “CASHBACK in points.” Don’t let this fool you — this is not a true cash-back card or program. As we mentioned above, utilizing the Sears Shop Your Way Mastercard® for everyday purchases will earn you bonus points within the percent back structure for 12 months from the date of opening your card. This is a pretty basic way to earn points — but the unusual part is that once the 12 months is up, so is your opportunity to earn bonus points with this card. On the marketing page for the basic Sears Credit Card®, Sears advertises “the opportunity to earn additional Shop Your Way points when you enroll in Shop Your Way and use your Sears Card” — but it doesn’t elaborate. They don’t report if cardholders will earn base points, bonus points, or a special percent back by using their Sears card. 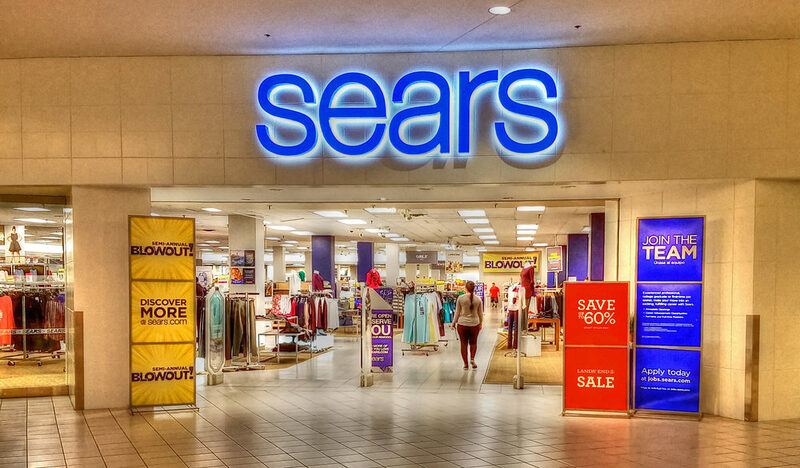 You don’t actually have to have a Sears branded credit card to earn Shop Your Way points at Sears and Kmart (although you’ll earn 2% back at these 2 stores by utilizing the Sears Shop Your Way Mastercard® there during the first year). In store, Shop Your Way rewards members can simply give their account number, email address, or phone number associated with the account during checkout to earn points. Similarly, online shoppers can provide this at checkout. Remember that as with all rewards programs, restrictions on some purchases may apply — so read your terms carefully if you’re questioning whether a certain purchase will earn you points. This is where things get pretty interesting from a credit card rewards platform perspective. 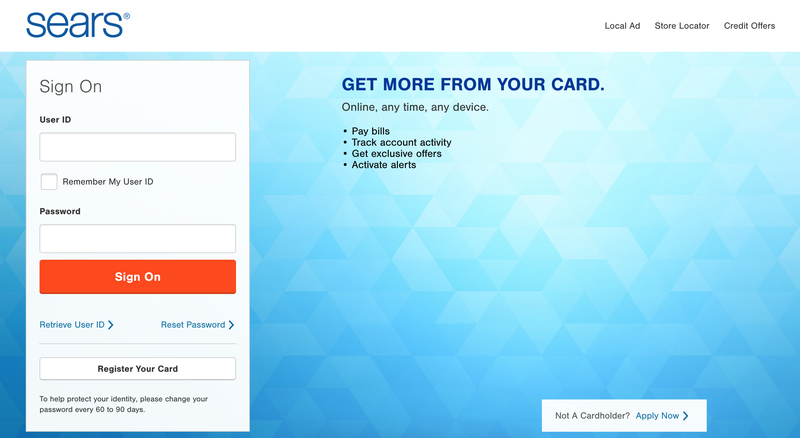 Most cards simply use a rewards platform for monitoring/managing a rewards account. However, the Shop Your Way program was designed before Sears teamed up with Citibank, and therefore it existed prior to these 2 cards coming into play. 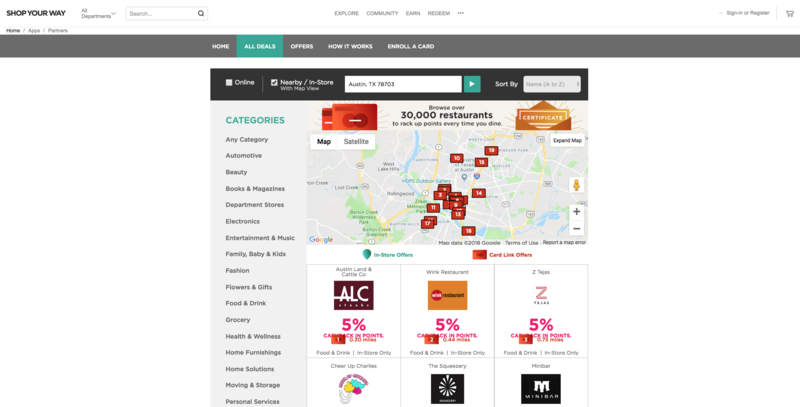 The platform actually acts like a shopping portal, where members earn bonus points just by using it. That’s why technically, neither of the Sears credit cards are needed to create an account or earn points through the platform. Of course, consumers will need some sort of credit card to checkout — either of the Sears cards could be used for that purpose, but they aren’t required. 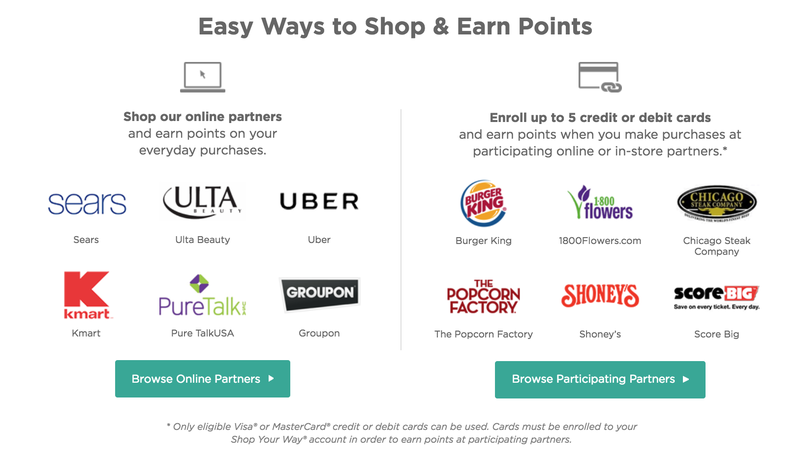 Once signed up to the program, users simply shop within the portal to earn points through online partners. As another way to earn points through Shop Your Way, rewards members can link up to 5 eligible credit cards to the program (which at this time includes some Mastercards and some Visa cards). When a cardholder makes a purchase with one of these cards at any participating partner (in-store or online), points are earned and automatically added to the user’s account, which can take up to 7 days. 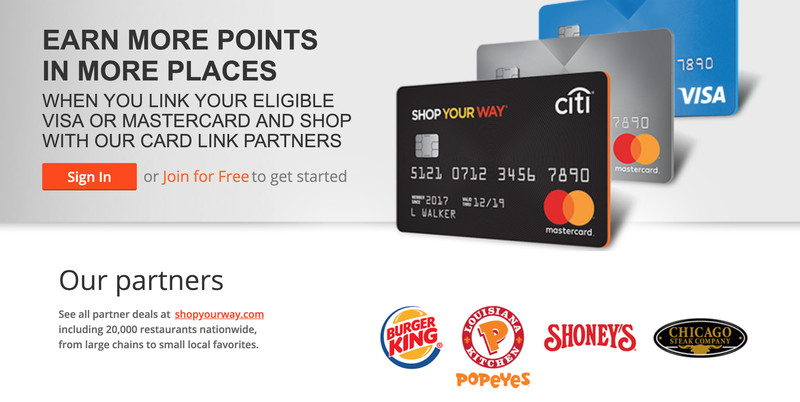 Shop Your Way boasts over 11,000 participating Card Link partners including stores, restaurants, etc., encouraging rewards members to earn points in places they’re probably already shopping. Hot Tip: You can find additional details on this confusing program at their FAQ here. Shop Your Way even advertises earning points through booking travel, riding with Uber, entering sweepstakes, utilizing special coupons, etc. 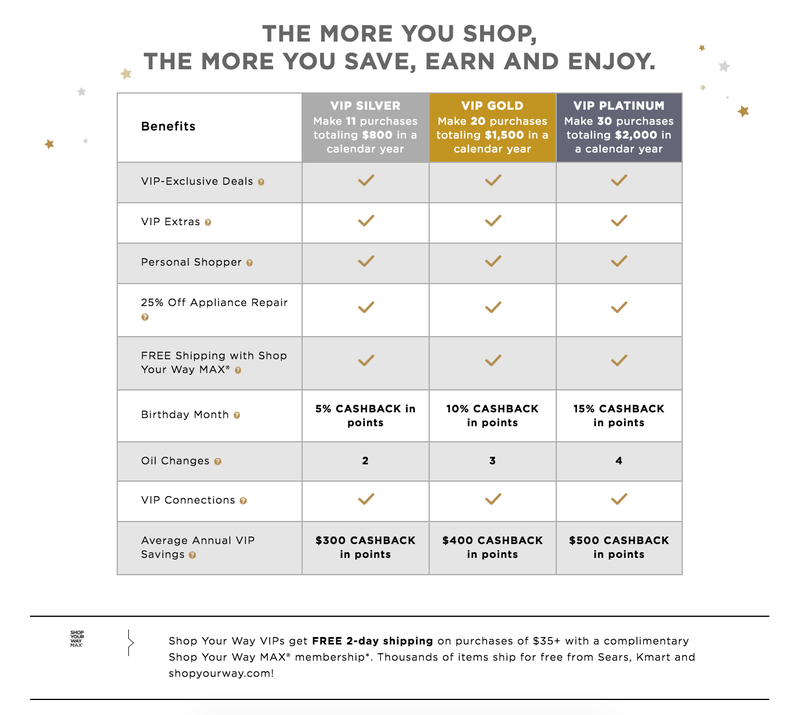 Yup, Shop Your Way also offers a VIP program based on rewards members reaching certain spending thresholds in a calendar year. Terms and conditions state that a shopper’s total balance is evaluated each week. If they qualify for VIP status or to move up to the next VIP level, the status will be reflected in the shopper’s online account within 8 business days, and you’ll be notified by email within 14 days. With this route, shoppers can achieve VIP status by meeting different requirements, based solely on how much they spend in a calendar year. This route has a higher spending threshold, but no requirements on the number of purchases made per year. This can usually be accomplished through fewer larger purchases over time. Now that you know all about earning rewards, what are they worth? 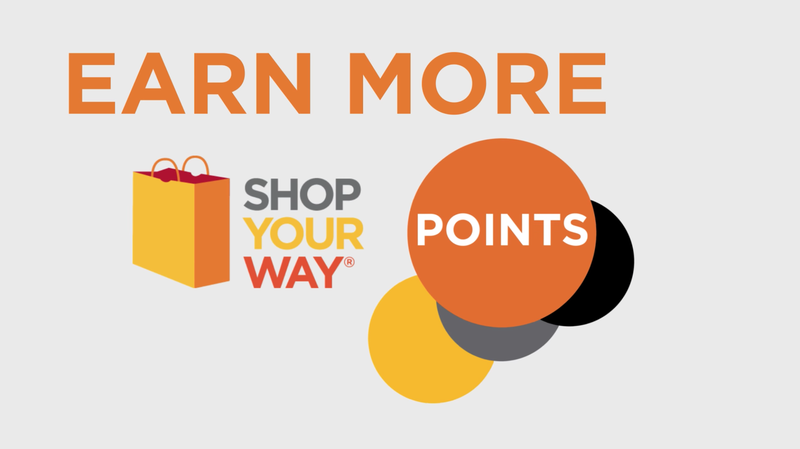 Shop Your Way rewards members generally earn 10 points per $1 spent (unless under a bonus structure or special promotion). Within the program, 1,000 points is equal to $1 in value. As a rewards member earns, points are automatically stored in the member’s account, and the balance can be accessed any time via the online platform or mobile app. Rewards aren’t “issued” in any form of a certificate, but instead your monetary value earned is available to apply at the checkout process through the online platform, or in-store by providing your member number/email/phone. The terms and conditions specifically mention that while you can currently earn points for Sears Home Services, your rewards points cannot be redeemed on Sears Home Services. When making a redemption online, members will want to be logged in to their account to access their points. When making a redemption in store, the member will want to provide the sales assistant with their account number, email, or phone number. At the time of purchase, shoppers may choose whether to apply all or just some of their rewards points. The best way to manage your rewards is online through the Shop Your Way platform or via the mobile app (Apple, Android). If you haven’t yet registered, you will obviously need to do that first — then each time you come to the online platform you can simply log in. In summary, it seems the Sears credit cards don’t provide all that much bang for your buck when it comes to savings. The basic Sears Credit Card® only provides the opportunity for special financing and exclusive savings offers, which aren’t all that lucrative. The Sears Shop Your Way Mastercard® does have an added bonus points earning structure, but it’s only good for 12 months. 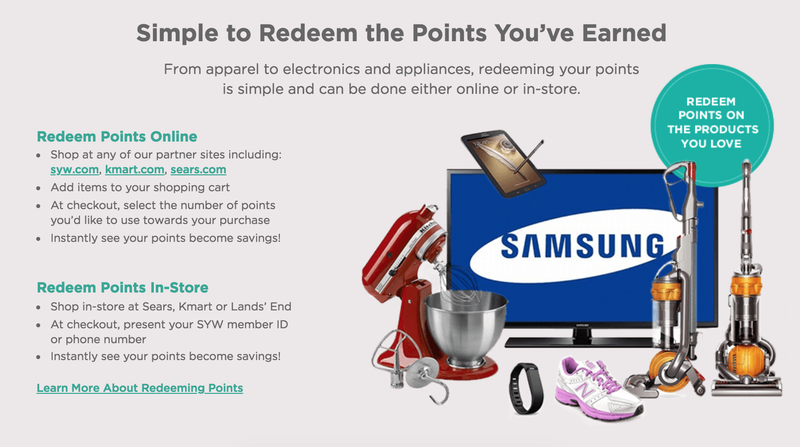 Additionally, the Shop Your Way program is pretty complicated, with tons of ways to earn points but few ways to redeem them. What’s even more disappointing from a Sears cardholder perspective? You don’t even need to have a Sears card to earn points or VIP status — you can link any eligible Mastercard or Visa. And all those drawbacks don’t even include the high fees and penalties associated with these cards. Unless you’re a die-hard Sears and Kmart shopper who plans to seriously engage in the Shop Your Way rewards program, there are likely better cards out there for you. Is the Sears Credit Card® a good card? The answer kind of depends on which card you’re approved for. In our opinion, the basic Sears Credit Card® isn’t of much use — there are many alternative cards out there that can afford you the same benefits and then some. If you can get the Sears Shop Your Way Mastercard® and you’re a loyal Sears and Kmart shopper (plus you plan to utilize the Shop Your Way rewards program enthusiastically), this could be a decent card for you. However, there are many drawbacks including high fees/penalties and the fact that the bonus points earning structure with the Mastercard is only valid for 12 months from approval. Again, there are likely other cards that could afford you similar benefits (and then some). Can the Sears Credit Card® be used anywhere? That depends on which Sears credit card you have. The Sears Shop Your Way Mastercard® can be utilized anywhere Mastercard is accepted. Is the Sears card easy to get? Most credit card review sites agree the basic Sears Credit Card® requires a credit score in the “Fair” range for approval, while the Sears Shop Your Way Mastercard® requires a credit score at least in the “Good” range. Those with “Good” to “Excellent” credit could very likely be approved for either card. However, for those with such favorable credit scores, there are plenty of alternative credit cards that would provide superior benefits. Does the Sears card have an annual fee? No, neither of the Sears cards have an annual fee. That being said, there are certainly other significant fees and penalties to watch out for. At the time of writing these FAQs, that includes a hefty 26.99% variable purchase (and balance transfer) APR, as well as a 28.90% cash advance APR. Prospective cardholders should always read the terms and conditions related to the card in question before deciding to apply. How does the Sears credit card work? If you have a basic Sears Credit Card, it gives you the option of special financing on some purchases as well as access to special discounts and savings…so it doesn’t really do much. The Sears Shop Your Way Mastercard® comes with the special financing options, exclusive discounts and savings, the ability to utilize the card anywhere Mastercard is accepted, and a category bonus points earning structure. 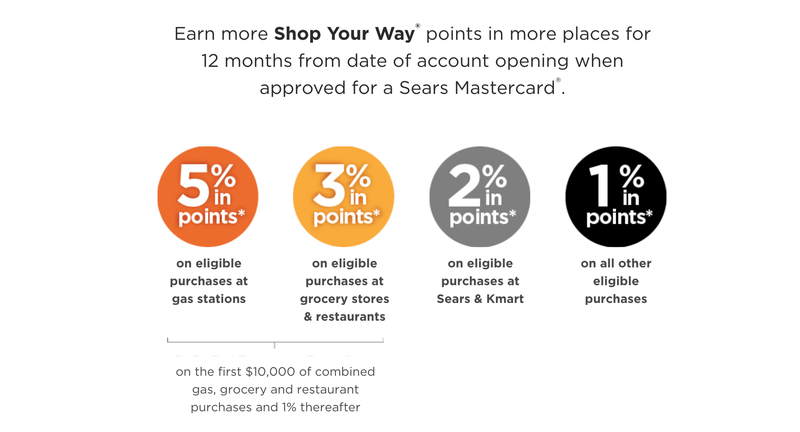 However, this bonus structure (5% points back at gas stations, 3% points back at grocery stores & restaurants, 2% points bach at Sears & Kmart, and 1% points back everywhere else Mastercard is accepted) is only valid for 12 months from opening the account. Sears Mastercard® users earn points through the Shop Your Way rewards program at a base rate (before bonuses) of 10 points per $1 spent. Every 1,000 points earned then equals $1 in rewards. The Shop Your Way program itself is a bit convoluted, but essentially affords you the option of applying your rewards at checkout either in-store or online at a limited number of redemption locations: Sears, Sears Grand, Sears Essentials, Sears Hometown Stores, Sears Home Appliance Showroom, Sears Hardware, Sears Outlet, Sears Auto Centers, Kmart, Lands’ End, and mygofer. Who issues the Sears credit card? Both Sears credit cards are issued by Citibank.